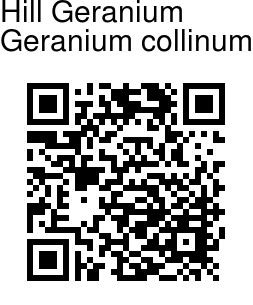 Hill Geranium is a perennial herb 15-50 cm or more tall. Rhizome is elongated. Stems are ascending, diverging, retrorsely velvet-hairy or glandular-hairy. Leaves are circular or somewhat kidney-shaped in outline, 1.5-8 cm broad, palmately cut into pointed lobes. Leaf-stalk of lower leaves is up to 13 cm long. Stipules are subulate-lanceshaped, 5-7 mm long, entire, velvety. Flowers are pinkish, with purple nerves, 2.8-4 cm across, borne in pairs. The pair is carried on a stalk 3.5-13 cm long, ascending-recurved. Sepals are 6-9 mm long, elliptic oblong, 3-5-nerved, velvet-hairy or glandular-hairy, awn 1-2 mm long. Petals are 1.4-1.9 cm long, obovate, lilac-rose or sometimes white, claw ciliate. Staminal filaments are pinkish, lanceshaped with a broadly triangular base and an abruptly narrowed tip, hairless except proximal half with some 0.1-0.6 mm cilia. Anthers are yellowish or pinkish, 0.9-3.4 mm. Fruit is 2.1-3.1 cm, erect when immature. Seed are 2.5 mm long, oblong, minutely net-veined, brownish black. 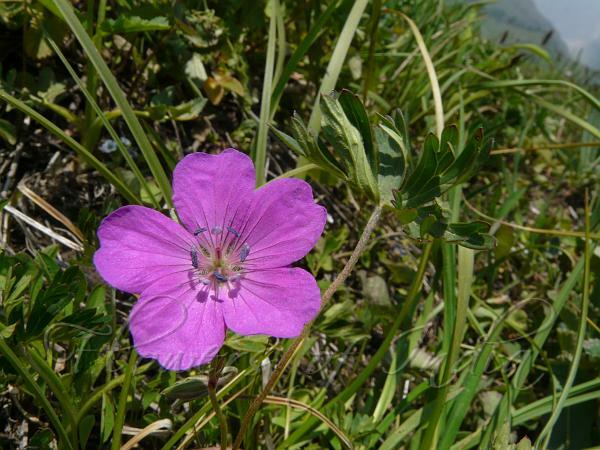 Hill Geranium is found in C. & S. Russia, W. Siberia, Romania, Turkey, Iran, Caucasus, C. Asia, Afghanistan and NW Himalayas, Ladakh, at altitudes of 2800-4800 m. Flowering: July-August.